SpeedSport Promotions have been involved with Tesa for several years and are the official supplier of Tesa tape to the motorsport industry. 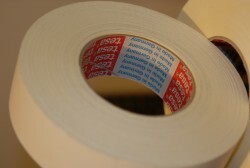 Tesa 4651 is a premium acrylic-coated cloth tape. It has a strong adhesion level and is resistant to the elements and tearing. Tesa 4651 is also waterproof and is suitable for marking, bundling, binding, fixing, sealing, identifying, and noise reduction. As official suppliers of Tesa Tape to the motorsport industry we are able to supply 4651 white, priced at £20.75 per roll. The product listed here for purchase is White. Currently we on stock this size 4651 in white, however, if you require a different colour then please contact us. We offer a fast and efficient delivery service priced at £4.50 for one roll and £8.50 for two rolls or more. Delivery is free of charge on any order over £150.00. We also stock some non-Tesa products including aluminium, foam and helicopter tape in various sizes.